Carl Kurlander hated growing up in Pittsburgh. “I was a shy, unathletic kid in a sports town whose mother had been divorced and [run] away from home to become an actress when I was 15 or 16,” said Kurlander. The Squirrel Hill native went on to cultivate a successful career in Hollywood — most notably as the writer of the story that would inspire “St. Elmo’s Fire” — but now he’s found himself finishing off his 15th year back in the Steel City. Kurlander, an excitable, quick-talking man who sometimes dons athletic sneakers with his dress clothes, has spent his years in Pittsburgh have since been filled with writing screenplays, teaching at Pitt, producing documentaries and serving as the president and CEO of the nonprofit, Steeltown Entertainment Project. This dedication to the city stems from his belief that Pittsburgh has the resources to reinvent itself as a regional leader in the film industry, to rival even Hollywood. When his mother decided to leave to pursue a career as an actress in New York City, she enrolled Kurlander and his brother, Tom, at the Shady Side Academy, where they boarded during the week. Instead of spending weekends with his mother, he was now babysitting for a Pittsburgh family to make ends meet. This family owned the St. Elmo Hotel in Chautauqua, New York, and offered Kurlander a job there as a bellhop. Coming from a sports town, he wanted to move somewhere with a culture much different than Pittsburgh’s. So he left for Durham, North Carolina, to attend Duke University. “I grew up wanting to change the world,” said Kurlander. He pursued a pre-med major, then switched to pre-law. Eventually, he found himself taking an English course taught by Deborah Pope, a professor emerita of English at Duke University. “I recall him as someone who stood out for his curiosity about writing and life,” said Pope. It was in her class that Kurlander began to see the powerful potential of writing. While working at the St. Elmo Hotel, Kurlander met and became infatuated with Lynn Snyderman, a waitress he met during his summer job at the hotel. He sent her the story he wrote, “St. Elmo’s Fire,” about love and growing up. She rejected his affections, but later encouraged him to be a writer. He took the story, folded it up and stuck it in his back pocket. The memory of Snyderman was never far from his mind. He received what he refers to as “a freak scholarship” to intern at Universal Studios after graduating from Duke. Kurlander packed his belongings and ambitions and traveled across the country. Once in Hollywood, he performed every lowly chore associated with being an intern. Joel Schumacher, a director and Kurlander’s boss, eventually gave him the opportunity to pitch one of his own stories. Kurlander dusted off his story for Snyderman. This would be his grand gesture of love. And thus, “St Elmo’s Fire” transformed from a story to a big-screen movie. It starred the group of actors known widely as the Brat Pack, and grossed $6,128,157 on its opening weekend on June 28, 1985. After the success of his first film in 1985, Kurlander wrote for shows such as “Saved by the Bell: The New Class” and “Malibu, CA.” Even though he was making a name for himself and being paid well, he still felt like there had to be more he could be doing with his life. 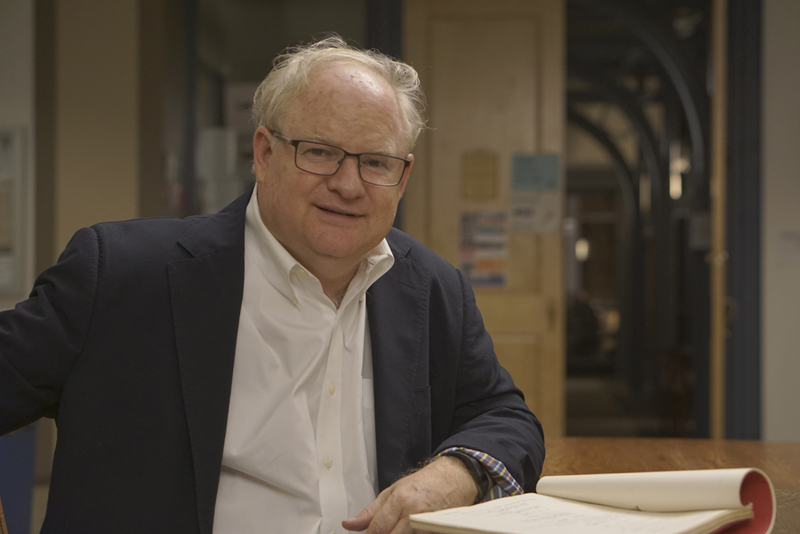 Kurlander donated money to Shady Side Academy in 2000, which led to a chance meeting with David Bartholomae, the then-chair of the English department at Pitt. Together they worked out a way for Kurlander to be a visiting lecturer at the University for a year. He began to direct his firsthand experience and passion toward the students he taught. He and his wife moved to Pittsburgh in 2001. A shocking move that he ended up being interviewed about on “The Oprah Winfrey Show.” Since then, Kurlander has been raising his now-17-year-old daughter, Campbell, and teaching at Pitt. He has found a home in the city he once dreaded living in. “What does Pittsburgh have that Hollywood doesn’t?” asked Kurlander. He saw these opportunities for building Pittsburgh’s film industry and knew he could use them, along with his experience, to help his students succeed. Several of his students have gone on to lead successful careers, such as Jon Hill and Nate Cornett. Hill and Cornett have both worked with the comedy website Funny or Die. One of his students, senior Jesse Irwin, is the son of Kurlander’s muse, Snyderman. Kurlander’s students describe him as a pusher with the best intentions. His passion is evident when he speaks about film culture. He talks as quickly as film threads through a movie reel, and gets so excited his words begin to jumble. Cornett, a 2005 Pitt grad, is now a cinematographer based in Los Angeles. His work has been featured on television networks such as the Public Broadcasting Service and Nickelodeon. “Pittsburgh has the resources to change the world,” Kurlander said. He has demonstrated this through efforts to increase film production in Pittsburgh and to connect with talented youth in the area. The largest piece of evidence regarding his work with the young people of Pittsburgh is the nonprofit he founded, Steeltown Entertainment, with Maxine Lapiduss and the late Ellen Weiss-Kander. Steeltown, which grew out of the student organization Pitt in Hollywood, aims to make Pittsburgh one of the places people reflexively associate with the film industry. It also offers opportunities for Pittsburgh’s young people to be involved in television and film projects such as “The Reel Teens,” a TV show created by the Teen Film Crew. Another similar upcoming initiative is a micro-budget feature film called “The Rehabilitation of The Hill District Housing Projects by Gwendolyn Livingston,” which students will be able to work on during a class at Pitt this spring. “It is so well-run,” said Irwin, who — in a strange twist of fate — considers Kurlander a mentor. As part of a class in Pitt’s film studies program, Kurlander and Irwin, along with other students, produced the 2016 Year of the Humanities documentary together. Irwin shares Kurlander’s passion for bringing a stronger media program to the University’s students. After knowing Kurlander for so many years, Irwin has come to one conclusion about Kurlander’s intentions. Disclaimer: Jesse Irwin works for The Pitt News.